I recently returned from a very fruitful research trip to Evanston, Illinois. I am working on a post about that trip (stay tuned next week). I was very fortunate to obtain travel funds from the North Carolina Arts Council, Pitt County Arts Council at Emerge and Wilson County Arts Council for a Regional Artist Project Grant. Thank goodness for Arts Councils. They rock. With that said, I am busy writing writing writing. I am eating, thinking, drinking, sleeping and even dreaming about The Community Kitchen. My husband is even dreaming about the Community Kitchen since I have been talking about it non-stop since returning from Evanston Saturday. When I was in Evanston, I was lucky to trace my great-grandmother’s, grandmother’s, and mother’s footsteps by visiting the original location of The Community Kitchen at 600 Davis Street, which is now home of the Mozart Cafe. To think each of them stepped foot in here, along with so many other historical women. 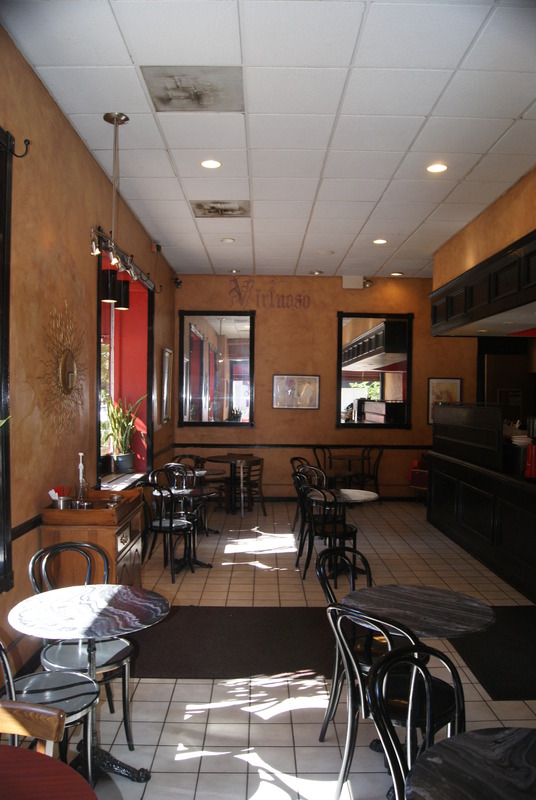 The current Mozart Cafe, which at one time was the location of the store front area of the Community Kitchen. My great-grandmother and grandmother once ran this famous Evanston bakery (located at 600 Davis Street from 1925-1951). With that said, My cousin (my mother’s cousin, my grandmother’s niece) kindly fed me nourishing meals while I stayed with her in Evanston. One of the meals she made me was Beet Soup. It was perfect for lunch on a busy day of researching. Mary Liz used Julia Child’s recipe for beet soup. The bright red color contrasted with the white bowl, creating a balanced pattern with a dollop of sour cream, garnished with fresh parsley. A white, red, white color collage of beauty. Delicious and delightful. Mary Liz and I sat and chatted while I took sips of this nourishing, healthy soup. She took good care of me while I stayed with her. She told me anecdotal stories about my mom, whom I am desperately longing for. My mother recently passed away. She passed away on her favorite night of the year, Christmas Eve. Her funeral/inurnment was July 1 at Arlington National Cemetery where she is inurned with my father, who was a Korean War veteran. My mother often spoke of The Community Kitchen throughout my life and most likely took me by 600 Davis Street as a child when we visited my grandmother at the Mather Home in Evanston. Interestingly enough, I walked into the lobby of the Mather Home last week and a woman said she remembered me when I inquired about my grandmother. She has been a long-time employee of the Mather Home. My grandmother lived there before it became the great big towers it is today. I was stunned. I asked her if she remembered my grandmother and she said, “Oh yes, of course. She was a really neat lady.” Then she said, “There is something about her that I am not remembering — what it is?” and she uncoiled her memory loops and traveled back to the late 70’s and early 80’s. 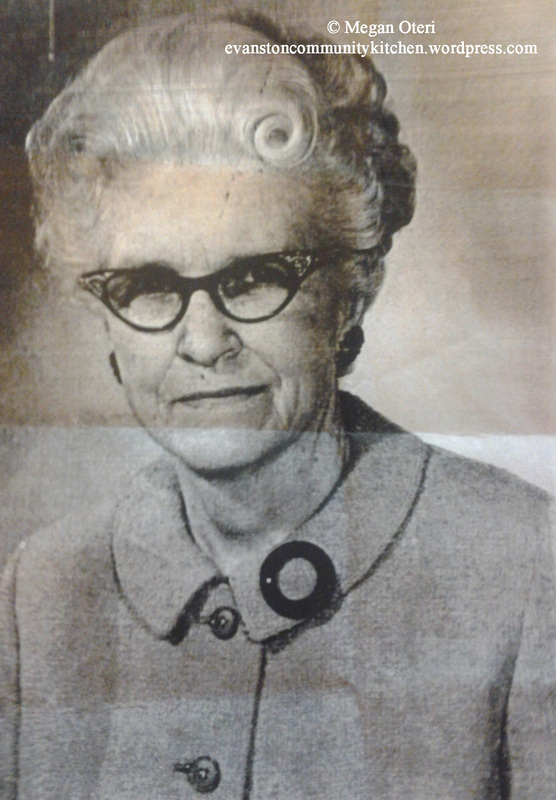 I mentioned, “She ran the Community Kitchen on Davis Street from 1947 to 1951 and was an executive chef in New York City.” Then I took out a photo of my grandmother from my overstuffed backpack bursting with newspaper articles and photocopies of research. Her eyes widened and she said, “Oh yes. I remember exactly. She loved to sit in the dining room and always took her meals facing the garden.” When she looked at the photo of my grandmother, she commented on Juney’s hair style saying, “How can you forget that hair? That hair style is not an easy one to do.” I felt such a burst of joy. Then I cried. Then I smiled. Then we hugged. What a neat lady and what a treat to be given that gift of memory. Food equals story. Here is a recipe from Bon Appetit for Five-Spice Beet Soup. Categories: Uncategorized | Tags: beet soup, downtown Evanston, Evanston, five-spice beet soup from Bon Appetit, Food, food stories, Mather Home in Evanston, memories of grandma, Mozart Cafe | Permalink.